Whether you're heading to a cantina or hosting a fiesta at your Springs luxury apartment home, give these tasty drinks a try. While Margaritas get all the love here in the U.S., the Paloma is considered Mexico's most popular drink. The mix of tequila, grapefruit soda and lime is truly refreshing. If you prefer, go a little upscale with grapefruit juice and club soda. Micheladas actually fall under the category of shandies, which are beer-based cocktails. Simply mix your favorite Mexican dark beer (Negra Modelo is a popular choice) with lime juice, orange juice and seasonings for a dash of heat. Customize your Michelada with additions like tomato juice or clam juice. Think of a Chavela as a Bloody Maria. It's a cousin to the Michelada that can serve as a beverage or appetizer. Instead of dark beer, start with Dos Equis or Corona and add Worcestershire, hot sauce, lime juice and clam juice. Don't forget to salt the rim! Garnish with items such as celery, shrimp or pickled green beans and serve with an optional shot of tequila on the side. This bright tequila punch is literally good enough to eat. It's easy to prepare and serve if you're entertaining guests. Combine silver tequila, dry Champagne and Sauternes with simple syrup and lime juice over ice in a large punch bowl. Stir in diced fresh fruit such as melons, pineapples, apples and grapes. Sweet agave and tart lime juice balance the heat of chopped jalapeños in this cocktail named after the scale that ranks the pungency of peppers. Moscow Mules are right on trend, so check out this Hispanic version that substitutes mezcal for vodka. 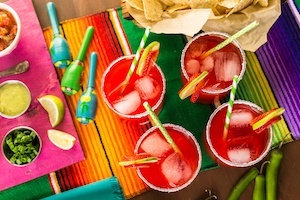 You'll love the festive look of this vivid pink drink served in a salt-rimmed glass. If you're serving as designated driver, or just prefer non-alcoholic beverages, there are some great Cinco de Mayo-appropriate choices. Horchata is a milky grain-based drink. The Mexican version uses long-grain white rice with milk, vanilla extract, almond extract and cinnamon. Serve chilled over ice and use cinnamon sticks as stirrers. Agua fresca translates to "fresh water," making it a nicely descriptive name for these cold, fruity drinks. Just about any fruit you can think of is a candidate for an agua fresca flavor, or you can experiment with exotic ingredients such as hibiscus flowers or tamarind. Where will you be celebrating Cinco de Mayo? Let us know in the comments!